Want a Job? How about a CAREER? Construction Ready and Aerotropolis Alliance are offering a FREE, ‘background-friendly’ and drug-free program for training and certification. You will be fully qualified for a construction career in only 4 weeks! Start a construction career earning $12-$15 per hour! Most jobs in our community and available now! 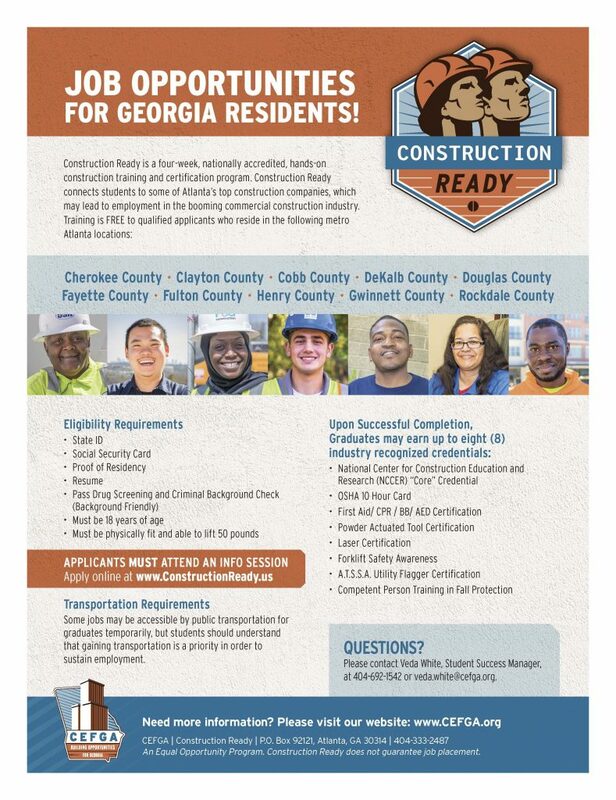 You are invited to attend the Construction Ready Information Session on Wednesday, April 3, 2019 from 10:30am to 2:00pm at Westside Works located at 261 Joseph E. Lowery Blvd, NW, Atlanta, Georgia 30314. Please bring as many of the items listed below with you. This process can take up to three hours. Proof of Income: FS Letter, SSI, any type of government assistance, wage inquiry. MALES ONLY – Selective Service Verification from www.sss.gov or if they were not here before age 26 a copy of the I-94/certificate of citizenship is a must to show when they arrived in the U.S. Thank you and we are looking forward to seeing you on Wednesday! Since inception of the program on Atlanta’s west side, Construction Ready has trained and placed more than 400 graduates, with completion and placement rates consistently exceeding 90%. For more information on upcoming classes or to apply, click here.